Malyia reunites a cat with his family. 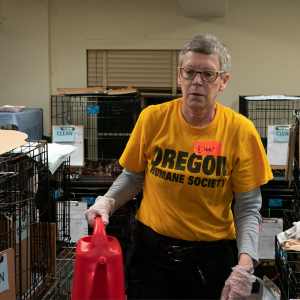 Since the Camp Fire ravaged the town of Paradise, California, the Oregon Humane Society has been in contact with local shelters and organizations offering assistance. On November 28, four OHS disaster responders deployed to help pets displaced by the fire. Before arriving, OHS coordinated with the ASPCA, which was already helping displaced pets in the area. The team was sent to Oroville, California, north of Sacramento, to help care for more than 200 cats and close to 100 dogs housed in an old community hospital being used as an emergency animal shelter. OHS volunteer Malyia Pladziewicz and OHS staff member Lyndsey Asparro were assigned to intake—helping bring in new animals and assisting with reunification of pets and owners. Volunteer Eileen Dennis and staff member Laura Klink were needed in animal care—medicating, cleaning, feeding and socializing with pets. The team has worked between the EAS site in Oroville and a shelter set up at the Chico Municipal Airport. Malyia and Lyndsey’s days have been filled with many heartbreaking stories of people desperately searching for their lost pets. They have been providing emotional comfort and support to people who visit the facility searching for their pets, and reuniting pets with their families. Eileen and Laura have spent their time caring for the hundreds of displaced animals. The team has been working close to 14 hour days. Every night they come together and have a team meeting with the ASPCA to debrief and establish a plan for the next day. “We are exhausted, emotional and drained at the end of each day, but this is a great team and we are all grateful to be here, working with our amazing partners from the ASPCA,” says Laura. The team will return to Portland on Saturday, December 8. 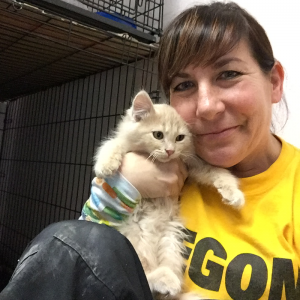 Along with this deployment, OHS has helped pets by transferring 45 cats, 5 dogs and 10 rabbits from California so shelters can make space for the pets displaced by the Camp Fire and Woosley Fire. All of the pets brought to OHS were in shelters before the fires began. 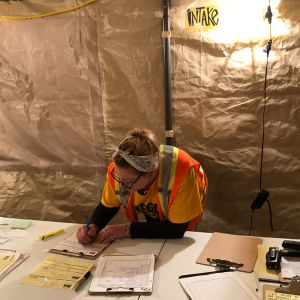 OHS is able to respond to disasters like the Camp Fire because of donor support. Make a donation here. Laura caring for kittens displaced by the Camp Fire. Eileen’s refills water bowls in the shelter. Lyndsey helps intake new pets and reunite pets with their families.